The Drum Machine. Warning: may materialize on unfriendly alien planets, or just in UK rock quarries. Musical tradition is, by definition, often “multi-player.” From people playing in bands and strin quartets to families getting together to sing, live performance is often shared. But while you can drop a computer player into an ensemble, the computer interface itself is largely focused around one user. The “personal computer” is just that – one person, one interface. So, why not extend that performance to more than one person? You’ve seen the instruments involved, but this video is the first opportunity I’ve had to tie them all together into a bigger picture. On a personal note, my hope is that this video and the compilation of instruments at jamboxes.net, catalyzes general acceptance of the word and the concept. Whether the category “jamboxes” is itself useful is to me a question worth asking. There are certainly some sympathetic examples here, multiuser musical creations that seem to belong together as a group. As you get further through the video, Moldover gets to some of those other case studies. (Warning in advance: the vid does get a bit goofy, which will likely either amuse or annoy you, depending on your mood.) 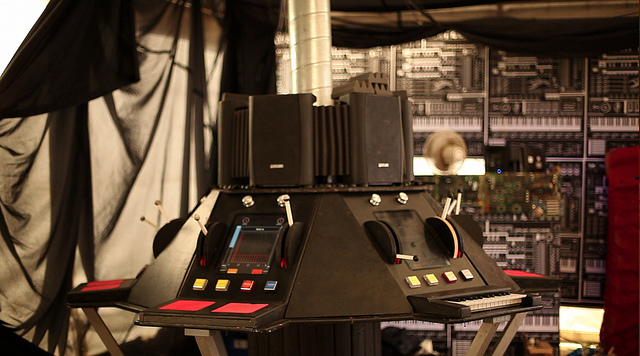 Now, none of these is terribly affordable or portable; quite a few resemble nothing so much as the console of the TARDIS, as in the machine pictured here at top. But they do all in their size allow several people to get in on the fun. Check out more of the installation-style jamboxes, meanwhile, at Moldover’s new site. They definitely look like a lot of fun.